Woohoo! I got something done on my car. Had to go in yesterday and tighten up the connection between the counterweight and transmission gear selector (it came loose, probably was not torqued well enough when I replaced the transmission). I decided, while I have the battery out, might as well take off the bumper and replace the headlights and grill. 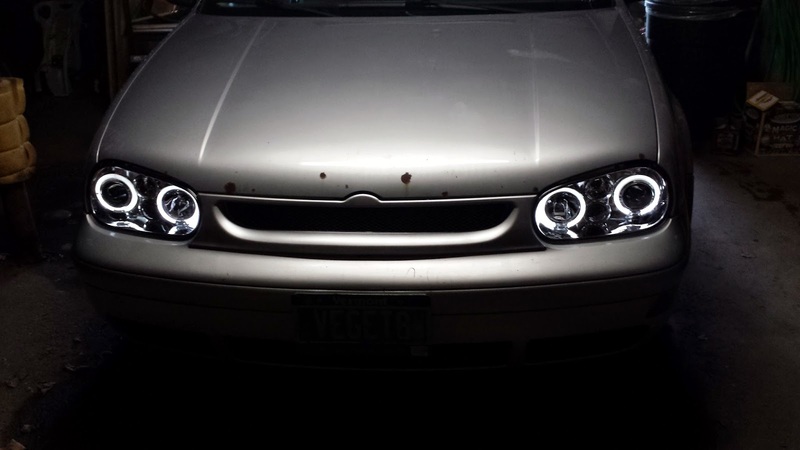 This job ended up being a lot easier than I thought, because I had left the wiring there for my old custom fog lights. Headlights are halogen projector type with OEM-style marker lights AND LED angel eyes. I wired the angel eyes to a switch under my dash so I can turn them on/off, depending on how fancy I want to be. I can't wait to be able to see where I am going at night. My old headlight lenses were so scratched up that the beam was diffused.